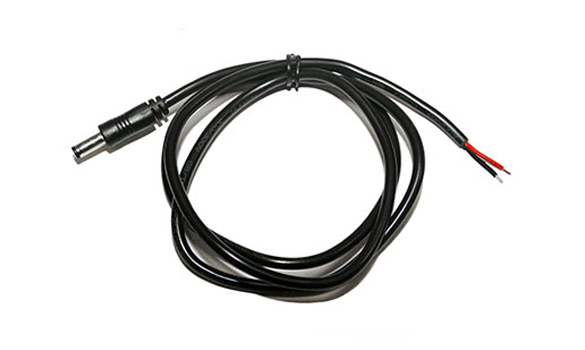 ConneX Bare Wire DC cable is an optional adapter accessory that allows connection between a 12V DC external power source, such as a boat battery, and a ConneX VGA or HD cable. The adapter comes with a 5.5mm OD / 2.5mm pin-hole male power-out plug on one end to connect to the female power-in plug of the ConneX cable and two bare wires on the other end for connection to a battery. ATTENTION: Connection polarity is very important. Reversing the polarity can damage the camera circuits and is NOT covered under warranty. Red wire is POWER (+), Black wire is GROUND (-). WARNING: DANGER OF ELECTRIC SHOCK. Disconnect incoming power when attaching or removing bare wire adapter.